This beautiful ocean front home at 103 Frazier Street, just south of the Village was originally built in 1925 for FD Aiken and the Aiken Family. My grandparents (Ike & Alice Aiken) lived in the house until after they passed away in the early 90's. It has recently been renovated and added to by the Corti Family. 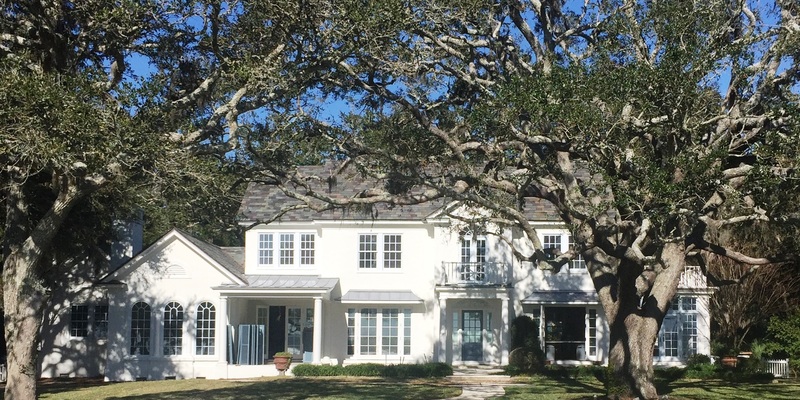 It sits on one of the largest ocean front lots on St. Simons. FD Aiken was my great grandfather and the son in law of Mallery King. Mallery was the Son of Ann Matilda Page King (owner and manager of Retreat Plantation). After the war, Mallery and Cuyler King (the only two surviving sons) retuned home to rebuild Retreat Plantation. Mallery was the original developer of King City and the heir to Retreat Plantation. He donated the land to the County which is now known as Mallery Park. In 1926, FD Aiken sold the bulk of Retreat Plantation to the Sea Island Company, which today is home to The Lodge, Sea Island Golf Club and associated communities. The ruins of the Retreat main house and hospital can be seen next to the Lodge and Golf Club. In the early 1900's, FD Aiken owned and operated the St. Simons Transit Company. The Emmeline and the Hessie were his two trusted ferry boats that delivered transportation to and from St. Simons and surrounding areas (see the Emmeline below). "Franklin's Walk". In the village, the photograph below can be found repainted on the outside wall at Sand Castles's restaurant - the picture tells the story of "Franklin's Walk". The story was that each morning Franklin (FD) would leave his home at 103 Frazier Street to take the ferry over to his office in Brunswick. The local islanders knew that the ferry would not leave until Franklin made his "Walk" and upon seeing him, they knew it was time to board the boat for Brunswick. Growing up on St. Simons Island and having the opportunity to share my experiences of what St. Simons was like in the past is a real joy. I know that the Island has changed (as have most places) and I'm keenly interested in seeing the Island continue to develop in a way that protects our beautiful tree canopy, the marshes and salt water estuary and our coastal waters. As a real estate professional, I have been dismayed at the over-building and housing density of several new subdivisions on the Island. In particular, the Mariner's development and the Harrington subdivisions come to mind. Whenever clear cutting is used as a method of preparing the land, I'm certain that our Island beauty is being destroyed. Historically, the Sea Island Company owned so much of the undeveloped land on St. Simons that most of us (Islanders) knew that growth and development was in a good stewards hands. That all changed when the Jones family lost the Company and the vast land holdings in foreclosure. Not only did the land get sold to multiple investors, the impact of the leadership of the Sea Island Company in our community diminished Today, we can be thankful for the Anshultz family acquiring and managing Sea Island, but WE must do the job of regulating growth and development on the Island now and in the future. As I write and share our island's historical tidbits that I'm personally familiar with, I look for ways to highlight and communicate best (and worst) real estate practices that impact our beautiful island home.